Download "A White Paper from AccessData Group. 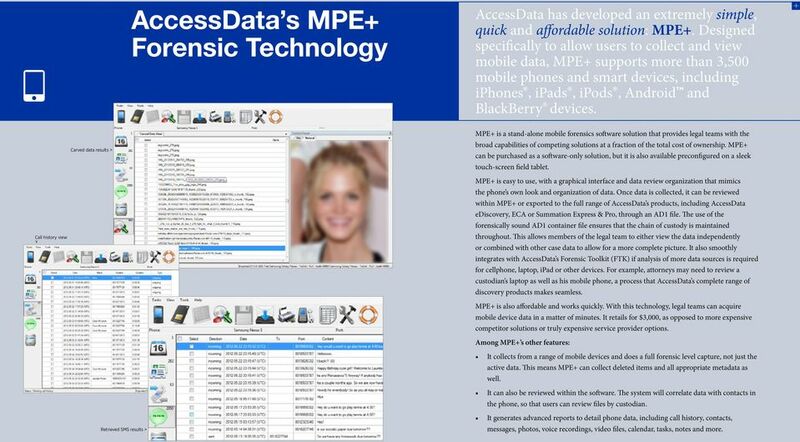 The Future of Mobile E-Discovery"
4 AccessData s MPE+ Forensic Technology AccessData has developed an extremely simple, quick and affordable solution: MPE+. Designed specifically to allow users to collect and view mobile data, MPE+ supports more than 3,500 mobile phones and smart devices, including iphones, ipads, ipods, Android and BlackBerry devices. + Carved data results > MPE+ is a stand-alone mobile forensics software solution that provides legal teams with the broad capabilities of competing solutions at a fraction of the total cost of ownership. MPE+ can be purchased as a software-only solution, but it is also available preconfigured on a sleek touch-screen field tablet. Call history view v MPE+ is easy to use, with a graphical interface and data review organization that mimics the phone s own look and organization of data. Once data is collected, it can be reviewed within MPE+ or exported to the full range of AccessData s products, including AccessData ediscovery, ECA or Summation Express & Pro, through an AD1 file. The use of the forensically sound AD1 container file ensures that the chain of custody is maintained throughout. This allows members of the legal team to either view the data independently or combined with other case data to allow for a more complete picture. It also smoothly integrates with AccessData s Forensic Toolkit (FTK) if analysis of more data sources is required for cellphone, laptop, ipad or other devices. For example, attorneys may need to review a custodian s laptop as well as his mobile phone, a process that AccessData s complete range of discovery products makes seamless. MPE+ is also affordable and works quickly. With this technology, legal teams can acquire mobile device data in a matter of minutes. It retails for $3,000, as opposed to more expensive competitor solutions or truly expensive service provider options. Among MPE+ s other features: It collects from a range of mobile devices and does a full forensic level capture, not just the active data. This means MPE+ can collect deleted items and all appropriate metadata as well. It can also be reviewed within the software. The system will correlate data with contacts in the phone, so that users can review files by custodian. Retrieved SMS results > It generates advanced reports to detail phone data, including call history, contacts, messages, photos, voice recordings, video files, calendar, tasks, notes and more. 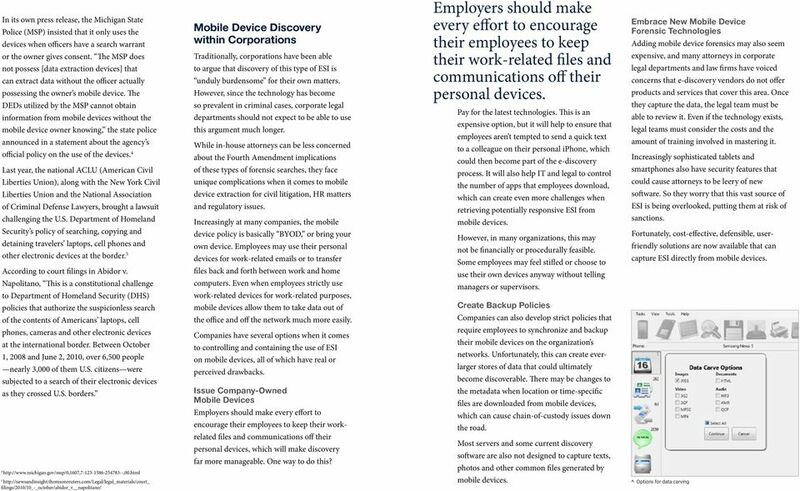 5 Conclusion The question is not if corporate legal departments will need to collect ESI from mobile devices, but when. Many departments are already faced with this requirement and pay by the GB or by the hour for service. Fortunately, this type of collection is no longer limited to the realm of forensic investigators or law enforcement. 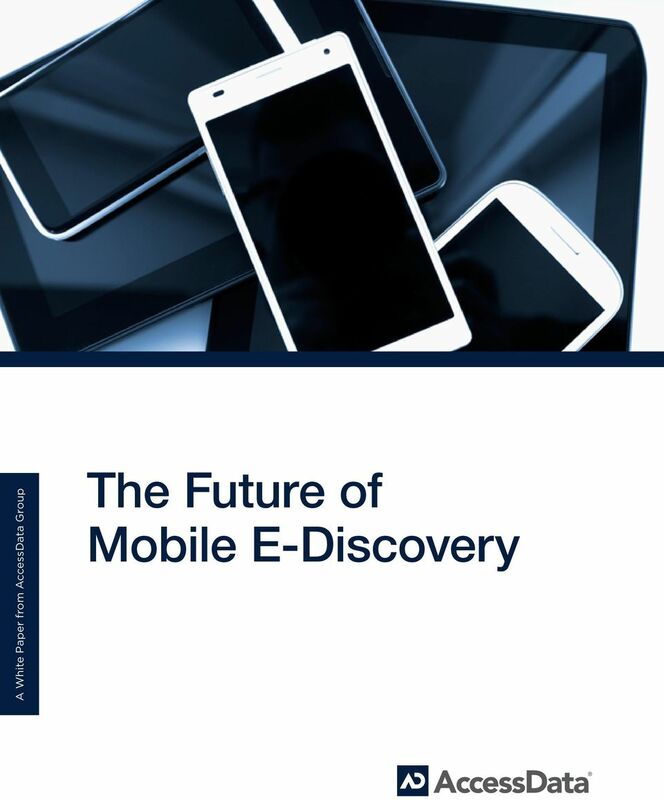 With AccessData s MPE+ technology, in-house counsel now have an easy and affordable way to make mobile device discovery a part of the routine e-discovery process. 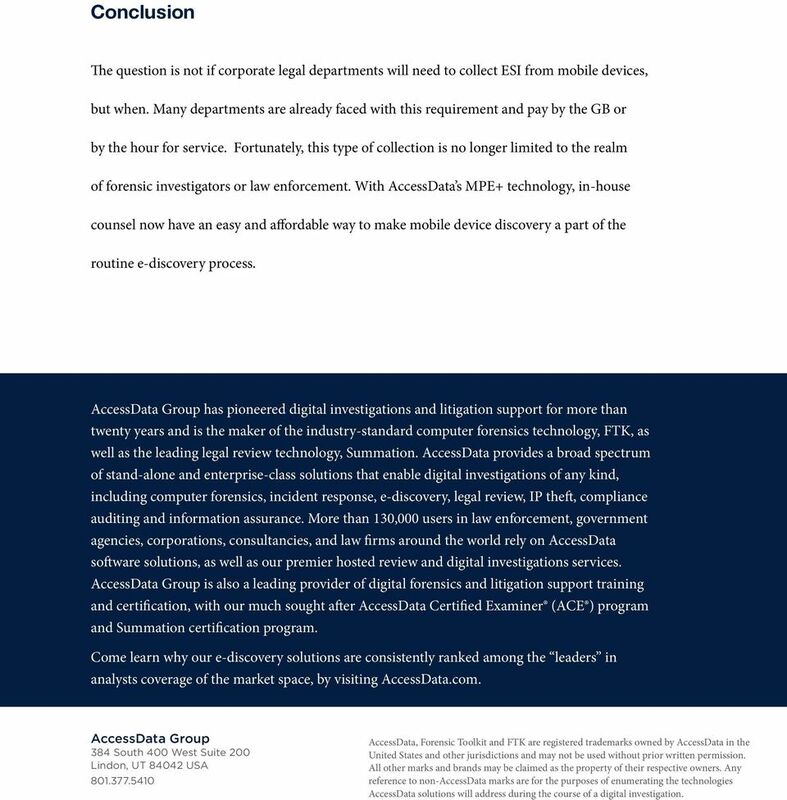 AccessData Group has pioneered digital investigations and litigation support for more than twenty years and is the maker of the industry-standard computer forensics technology, FTK, as well as the leading legal review technology, Summation. AccessData provides a broad spectrum of stand-alone and enterprise-class solutions that enable digital investigations of any kind, including computer forensics, incident response, e-discovery, legal review, IP theft, compliance auditing and information assurance. More than 130,000 users in law enforcement, government agencies, corporations, consultancies, and law firms around the world rely on AccessData software solutions, as well as our premier hosted review and digital investigations services. AccessData Group is also a leading provider of digital forensics and litigation support training and certification, with our much sought after AccessData Certified Examiner (ACE ) program and Summation certification program. Come learn why our e-discovery solutions are consistently ranked among the leaders in analysts coverage of the market space, by visiting AccessData.com. AccessData Group 384 South 400 West Suite 200 Lindon, UT USA AccessData, Forensic Toolkit and FTK are registered trademarks owned by AccessData in the United States and other jurisdictions and may not be used without prior written permission. All other marks and brands may be claimed as the property of their respective owners. Any reference to non-accessdata marks are for the purposes of enumerating the technologies AccessData solutions will address during the course of a digital investigation. C. All responses should reflect an inquiry into actual employee practices, and not just the organization s policies. Questionnaire on Electronically Stored Information (March 17, 2011) I. Definitions and Instructions A. ESI means electronically stored information as the term is used in the Federal Rules of Civil Procedure. The E-Discovery Maturity Model ADAM HURWITZ, CISSP September 2010 Tel. (888) 338-4242 www.biaprotect.com E-Discovery has evolved and grown over the last ten years to become a necessary part of doing business. 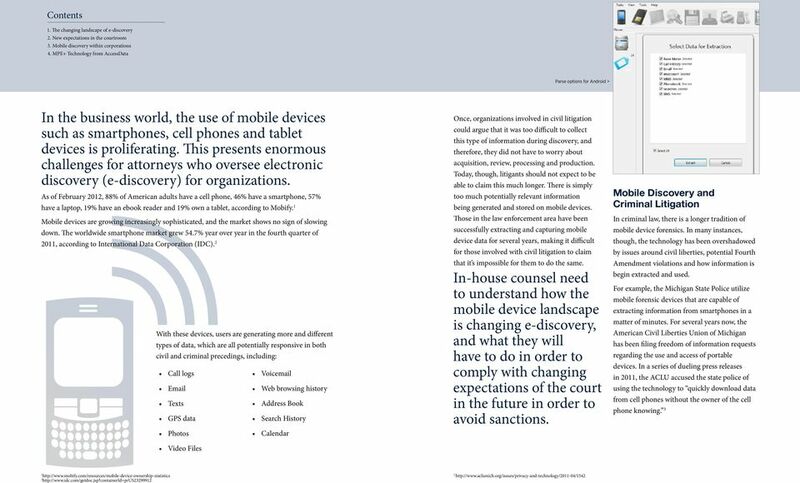 This article first appeared in the International Technology Law Association s ebulletin, Volume 2, Issue 3, summer 2008. Sensitive Incident Investigations. Digital Risk Management. Forensics Testing. Simplify the e-discovery process by learning which tools to use and when to use them. CHAPTER 7. Proactive. Review tools. litigation hold tools.